Beware! This is a picture of a crime scene. 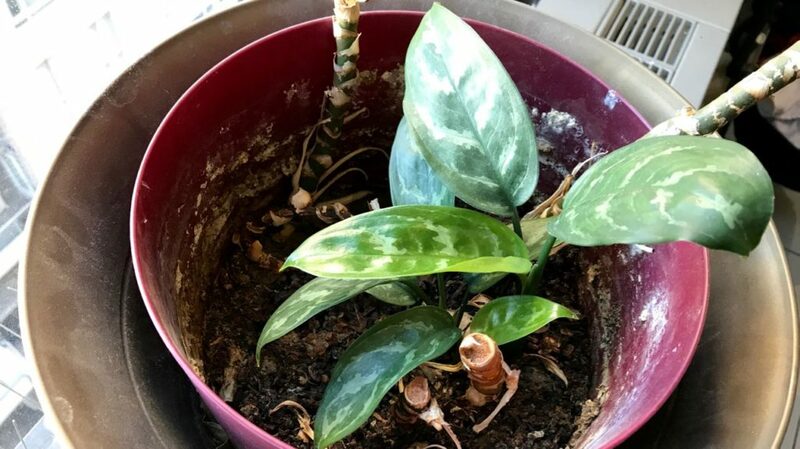 It’s a dumb cane plant (Dieffenbachia), being killed slowly by a combination of too much neglect and too much “love.” How can that be, you ask? Look at the tell-tale signs. The first clue is that “palm tree” effect that happens when lower leaves die off through improper care. This poor victim was found in my doctor’s office! Now the double-whammy of neglect/love comes in: your house plant gets too dry, then you over-compensate by deluging it in water, and letting it sit in a swamp. That’s a death warrant for most houseplants, because the waterlogged soil shuts out air from the plant roots. Roots die, plant dies – it’s as simple as that. The white rime is evidence this happened from death-by-swamping. The white stuff is from minerals in hard water and salts from fertilizers left after the water evaporates. Treat it by flushing the soil of any potted plant at least once a year. No toilet is involved! Simply take the pot off its saucer or out of its decorative outer pot and run it under a tap till water runs through the base. Then do it a couple of times more. Make sure all excess water has drained out before putting the plant back. Never let it sit in water. To be sure the white stuff doesn’t reappear, empty out any standing water in the saucer or outer pot every time you water. Then remember to water! For Dieffenbachia, do it when the soil surface feels dry. 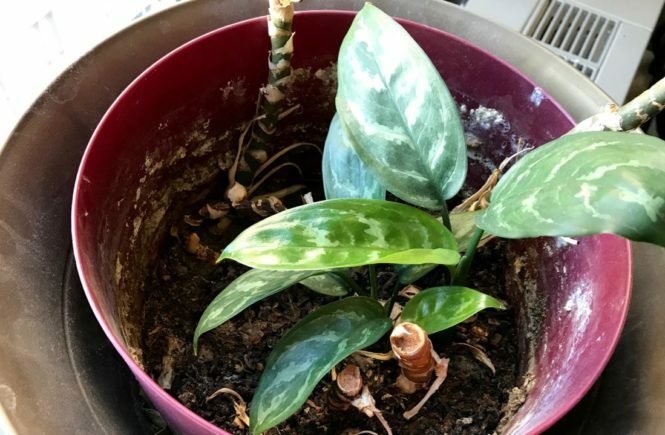 Don’t be like Helen the House Plant Killer – or her doctor. Diefs hate me. I’ve yet to meet one I could keep alive. Actually, that applies to snake plants and succulents, too… Yet I’ve nursed coffee plants from saplings to berry producers in an office!!! Go figure. And I can’t soft-boil an egg, Traci-Anna. We all have our strengths and unstrengths. Really good practical advice. House plants have been essential to me getting through this dark cold winter. Did you rescue this poor plant? Or is it still in the office hoping for someone with a warm heart and a green thumb to happen along?